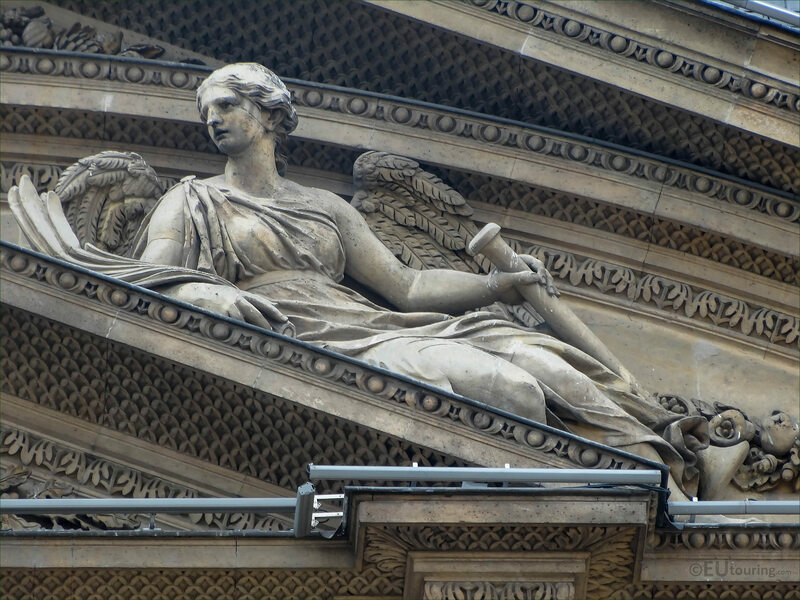 When visiting Paris you will no doubt see some of the tourist attractions around this remarkable city, and one such attraction that millions of people visit each year is the Musee du Louvre, which is not only an impressive museum that holds the Mona Lisa painting, but it also has some very impressive architecture on a grand scale, as you can see from these high definition photos we took. 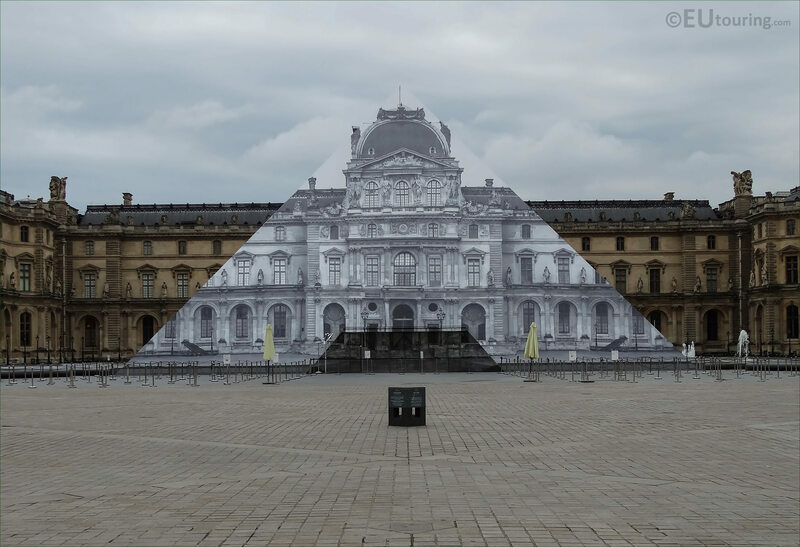 This first HD photo shows a part of the Louvre Museum, with what would be the I M Pei pyramid, but as you can see, for a temporary exhibition, the street artist JR produced a black and white anamorphic photograph for an optical illusion known as trompe l'oeil, or fooling the eye, where at a certain angle, the glass pyramid seems to disappear and become the historical Louvre Palace. 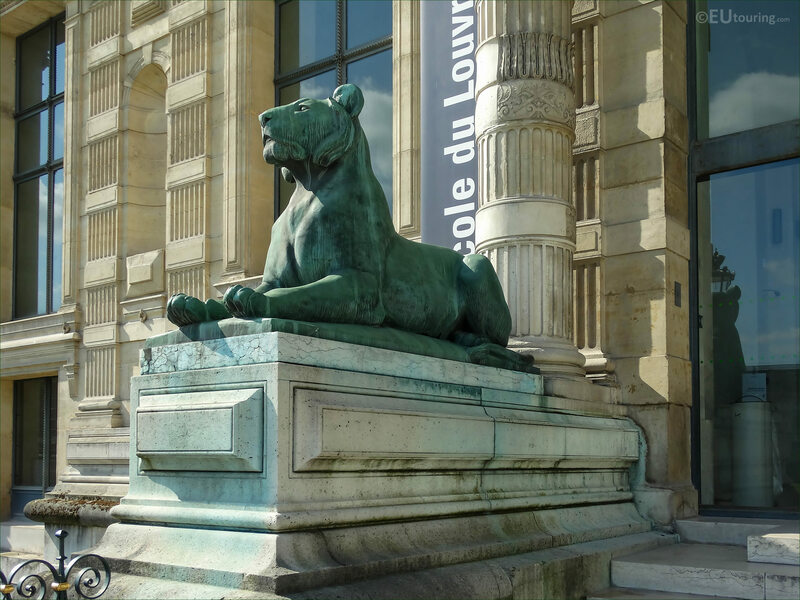 But here is a photograph we took looking towards just one part of the Musee du Louvre called Pavillon de Marsan, while we were standing within the Jardin des Tuileries, and as you can see, there is a large Ferris wheel, which is set up each year during the summer months by the Rue de Rivoli to the delight of many tourists and Parisiens, where it can offer great views of the city and this historical location in the 1st Arrondissement of Paris. 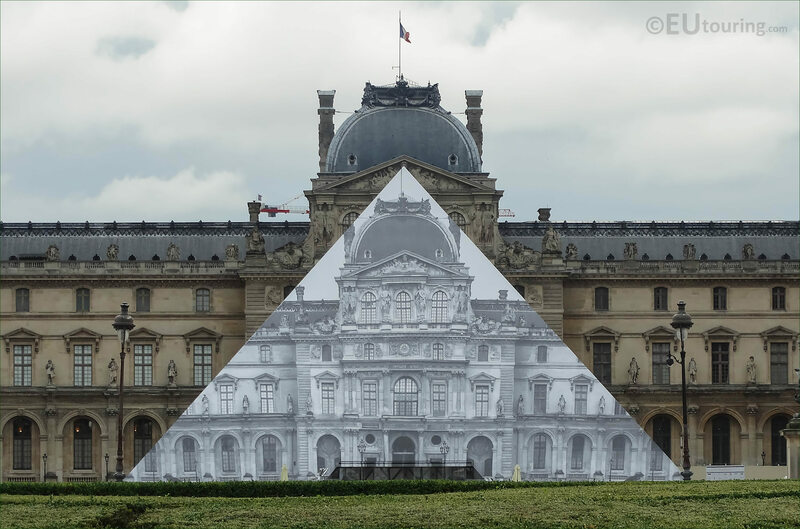 While standing in the courtyard of The Louvre called the Cour Napoleon, we took this panoramic photo showing the impressive size of this former royal palace with its different wings and pavilions, along with the more recent addition of the modern pyramid, which is now the main entrance to the museum. 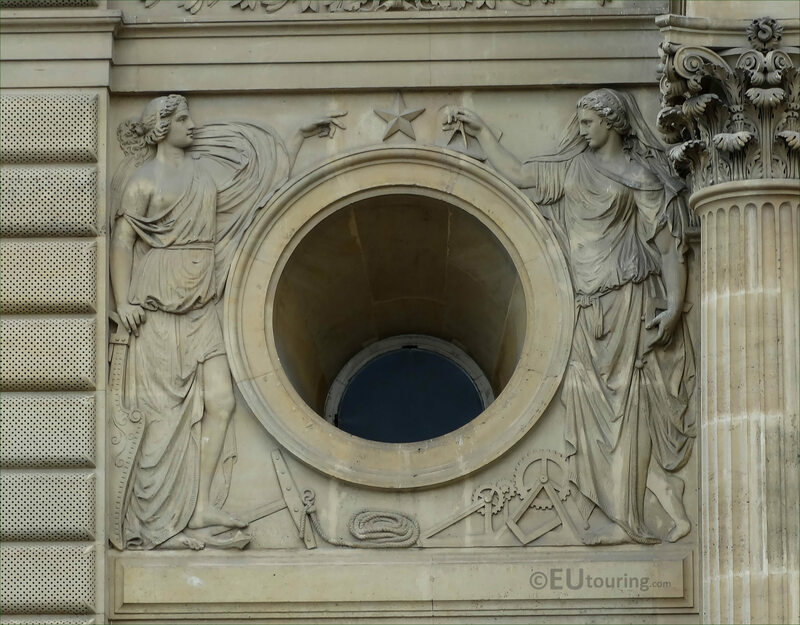 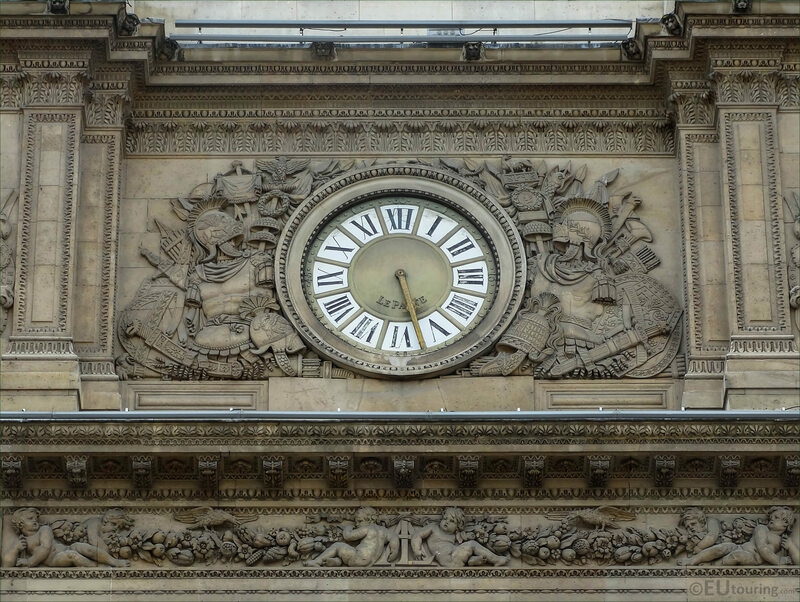 However, this time we were within an entirely different courtyard of the Louvre Museum called the Cour Carree and took this photo showing the Pavillon de l'Horloge, which basically translates as the Clock Pavilion, and with the additional pinpoints, you can see some of the ornate architectural details on the facade. 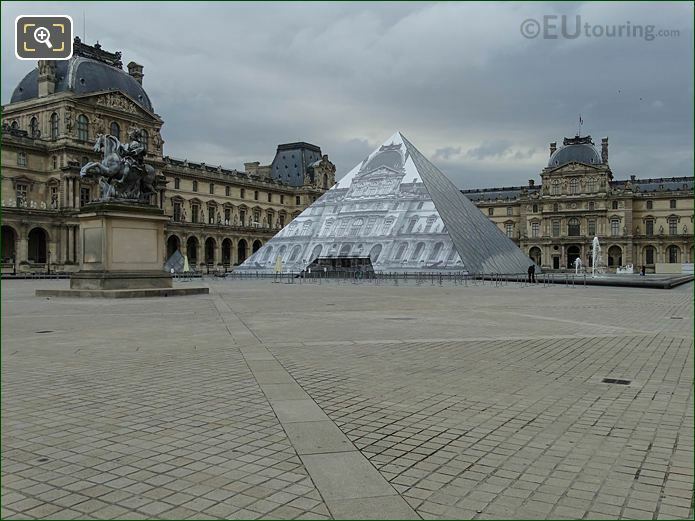 We took this particular photo of The Louvre museum showing the main courtyard with the I M Pei pyramids east facades, and to give you an idea of where we were, you have the Louvre going round us on three sides as we were looking towards the Tuileries Gardens, and you can just see the Ferris wheel to the right, yet to the left, there is an exit that take you out to the River Seine, and although hidden from view, the Arc de Triomphe du Carrousel would be just behind the pyramids. 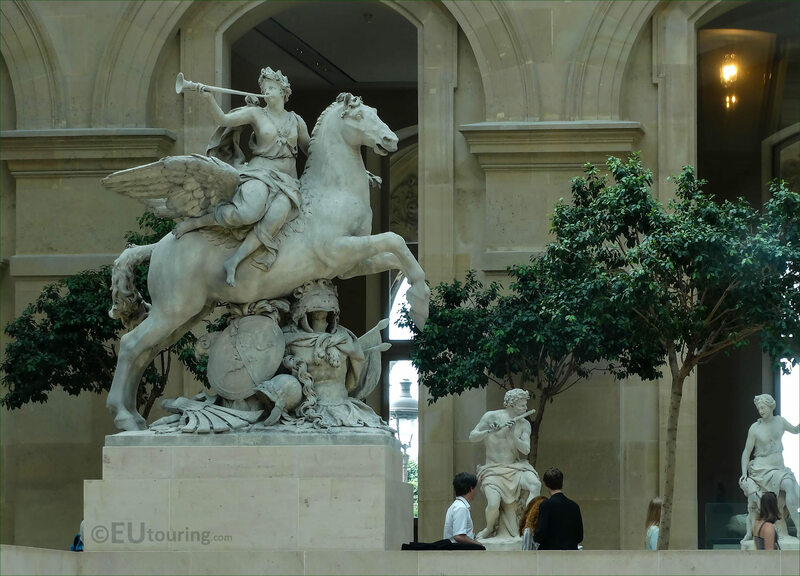 Whereas this photo shows the Richelieu inner courtyard of Musee du Louvre with just a small selection of the thousands of exhibits on display that range from statues and sculptures through to paintings and artefacts, which hopefully provides you with an idea as to how enormous this museum really is and why you can spend days going round it. 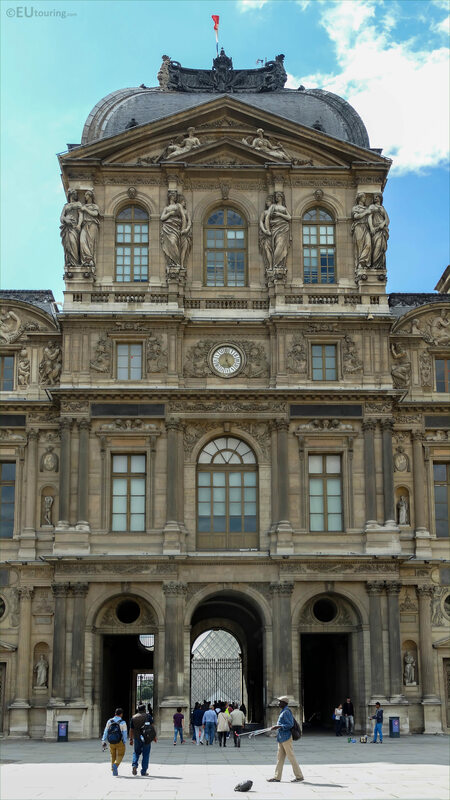 The Louvre is without a doubt the most impressive museum in Paris, and known throughout the world, it is located within a former royal chateau called the Palais du Louvre, and this is a photo we took looking towards Pavillon de Marsan wing of this elegant palace from within the Tuileries Gardens, which was designed by Andre Le Notre. 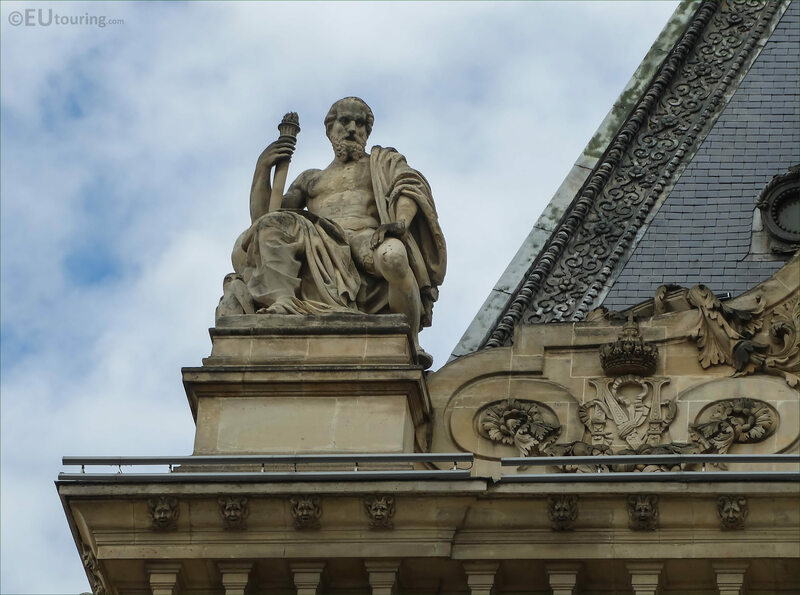 Yet here is another panoramic photo we took showing storm clouds over the Musee du Louvre, but this time we were in the courtyard called the Cour du Carrousel, and the Arc de Triomphe du Carrousel was behind us, so in this image you can see even more additional wings of this famous museum in Paris. 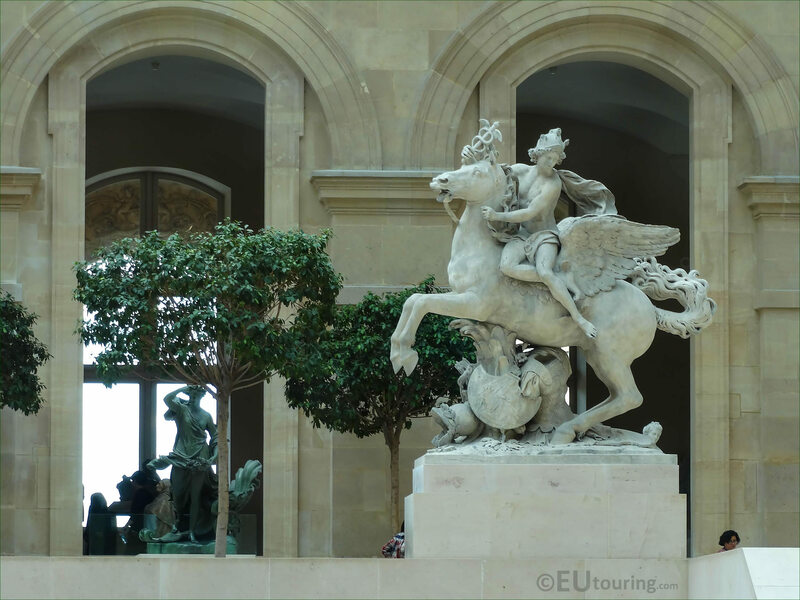 We took this close up photo of an equestrian statue at the Louvre Museum, which is located within the main courtyard Cour Napoleon, and the original was produced in the 1600s to depict a young King Louis XIV riding his horse, and although the original is at Chateau de Versailles, when the pyramids were put in place the designer wanted a statue sitting in the courtyard as well, so this is a lead copy. 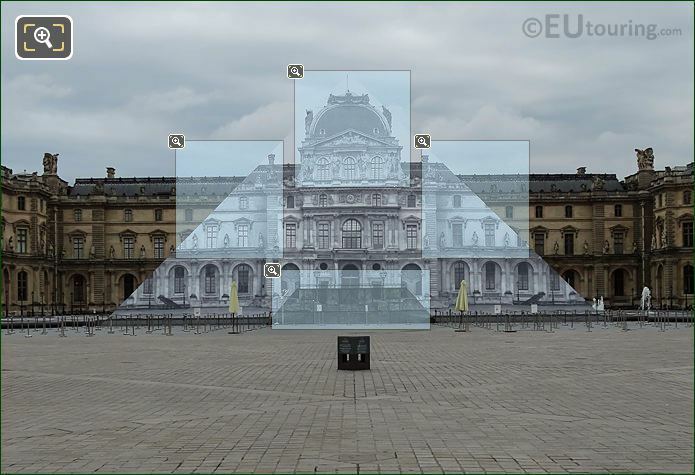 And here you can see the equestrian statue of King Louis XIV in the Cour Napoleon with the I M Pei glass pyramid looking to the side with the trompe l'oeil disappearing pyramid temporary feature by JR, with his main aim of getting people to see things differently, which is why his colossal photographs have been featured in different places all over the world including here at The Louvre, the Tate Modern in London, Flatiron Plaza in New York, in Kibera, Kenya, etc. 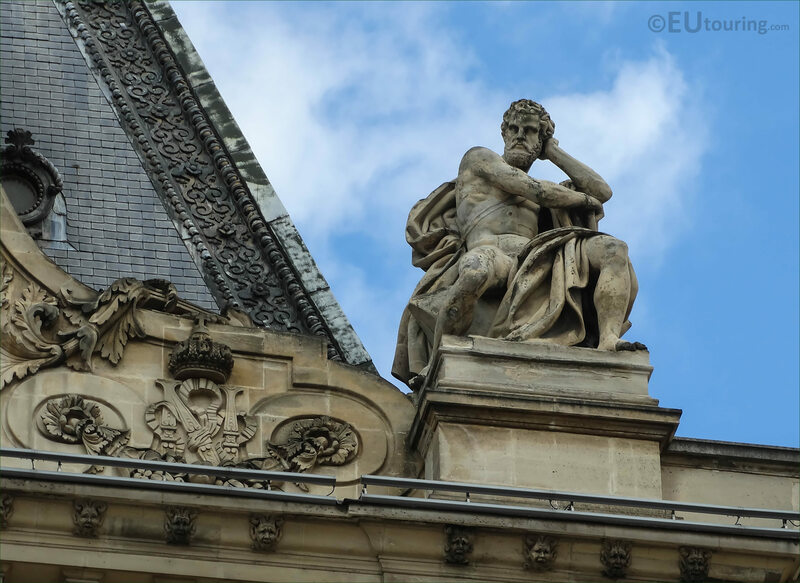 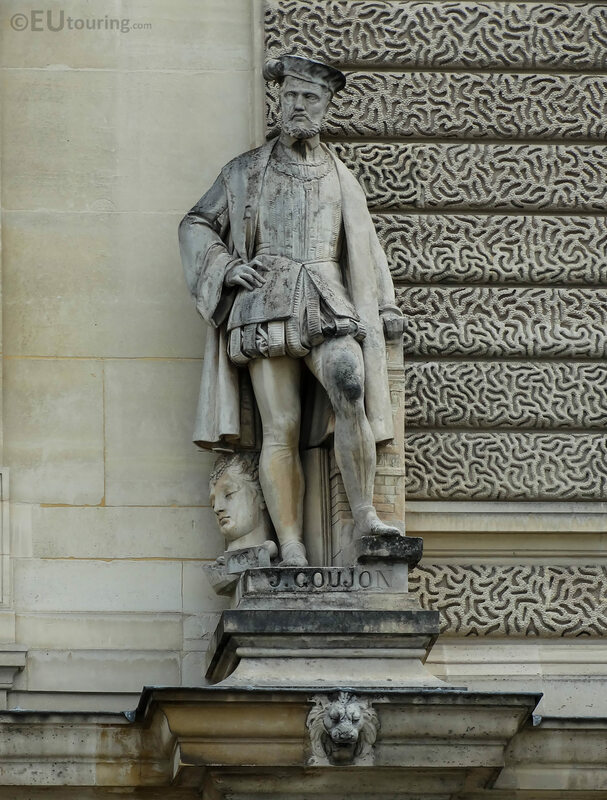 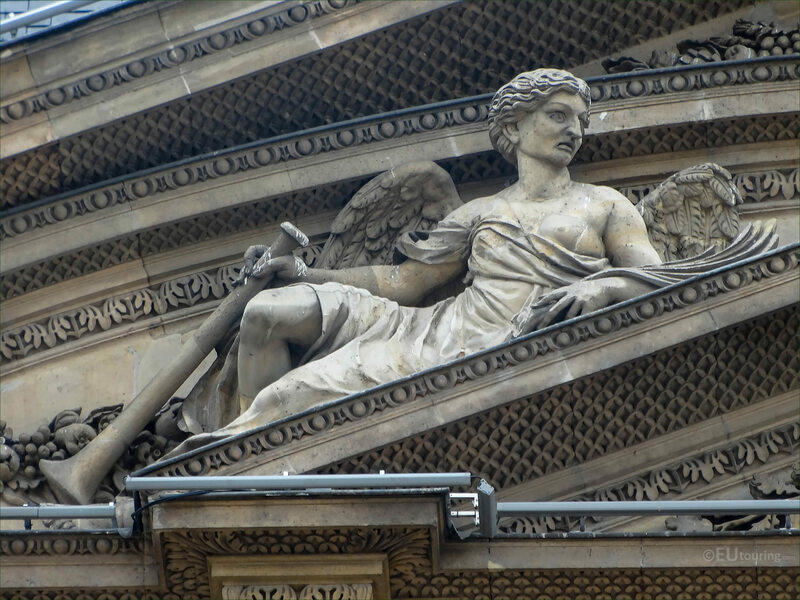 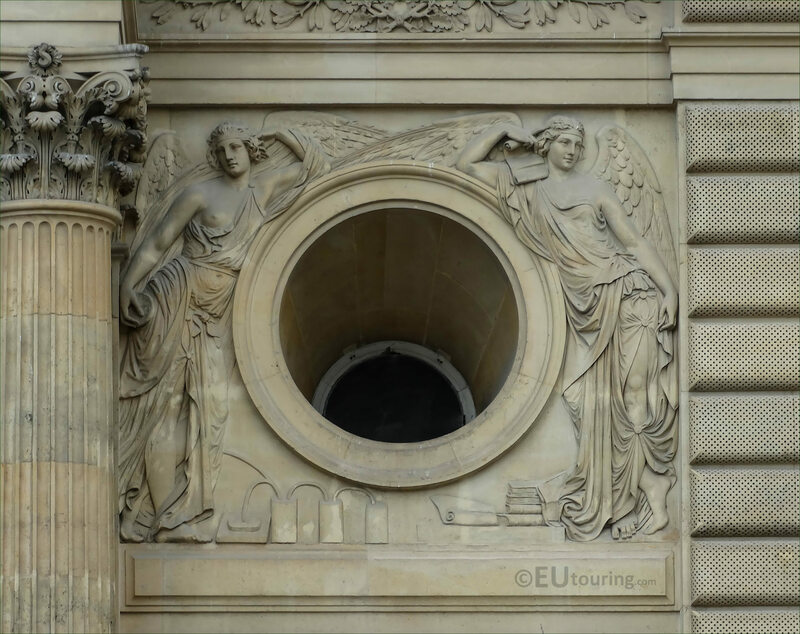 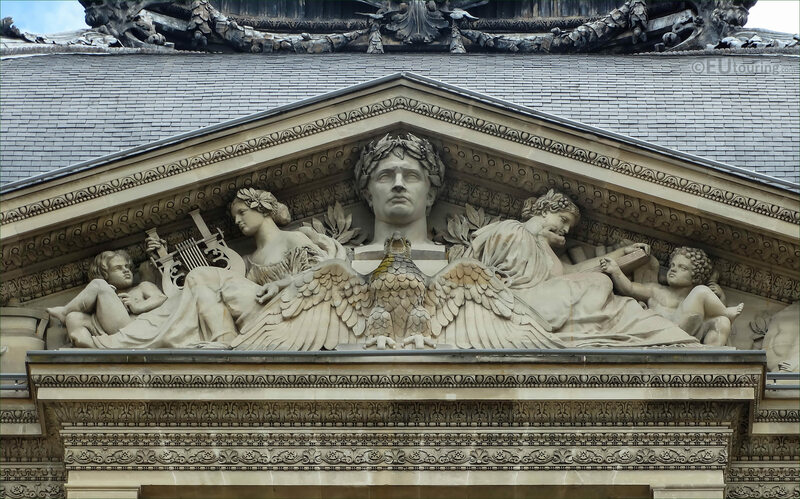 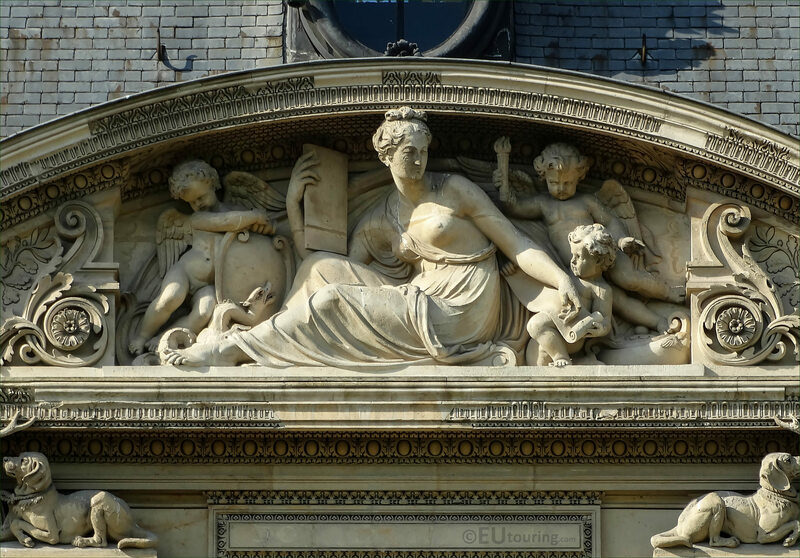 You will find that the Palais du Louvre had a major restoration and renovation project undertaken back in the mid 1800s, which is when hundreds of different sculptors were employed to add different statues and sculptures to the facades, just like this top pediment and the bas reliefs below located around one of the top windows on Aile de Flore. 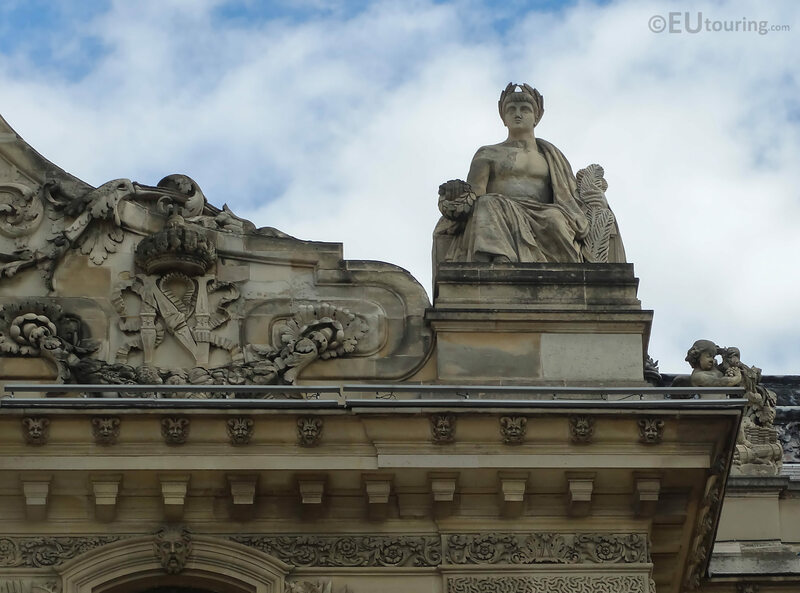 After walking through the Tuileries Gardens and past the Arc de Triomphe du Carrousel, you will reach the main courtyard and get to see the Musee du Louvre in all its glory, and this is a photo showing just part of this immense former royal chateau with the impressive pavilion on the corner being called the Pavillon Mollien, and to get your bearings, this is the side closest to the River Seine. Here you can see some of the people enjoying a hot summers day at The Louvre by the water feature and the I M Pei pyramid, yet if you look above the main entrance to the Musee du Louvre you will see the infinity loop symbol, which was another temporary installation by the conceptual artist Michelangelo Pistoletto with mirrors to convey a message to get people, especially politicians, to look at themselves and think of the financial crisis and the future of humanity. 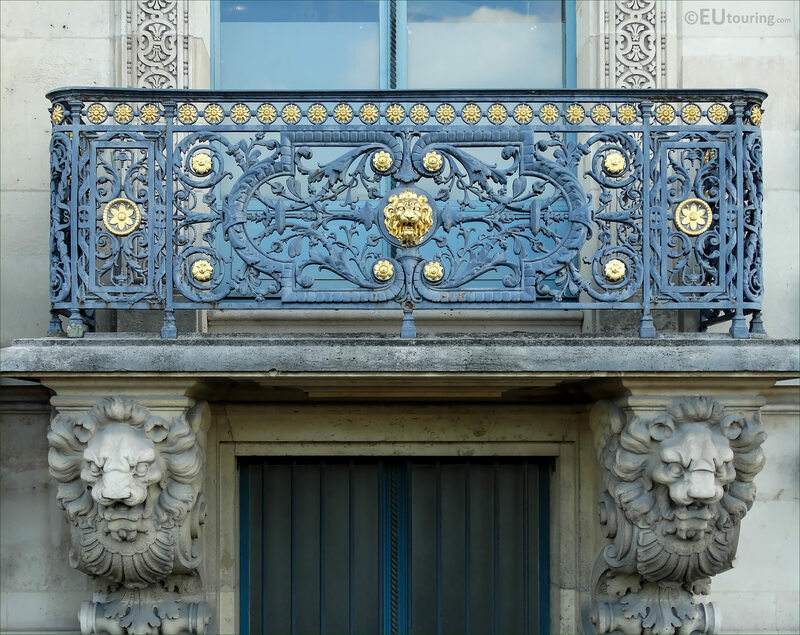 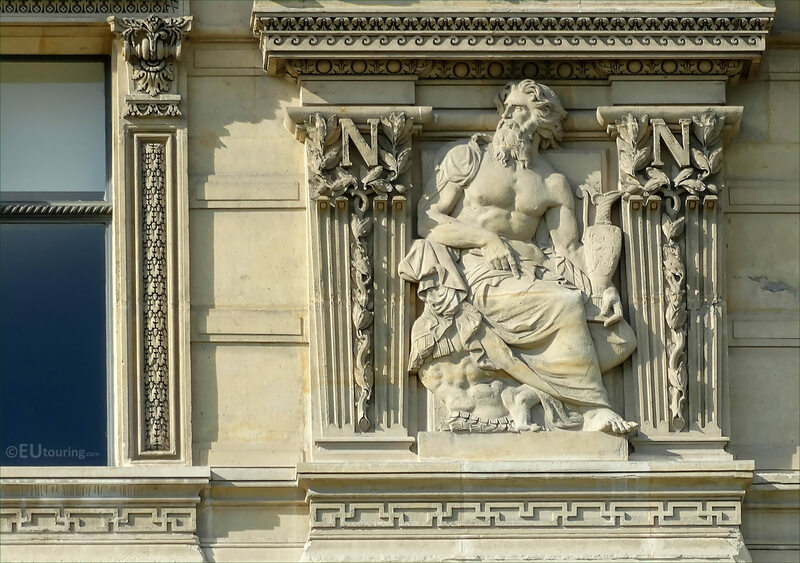 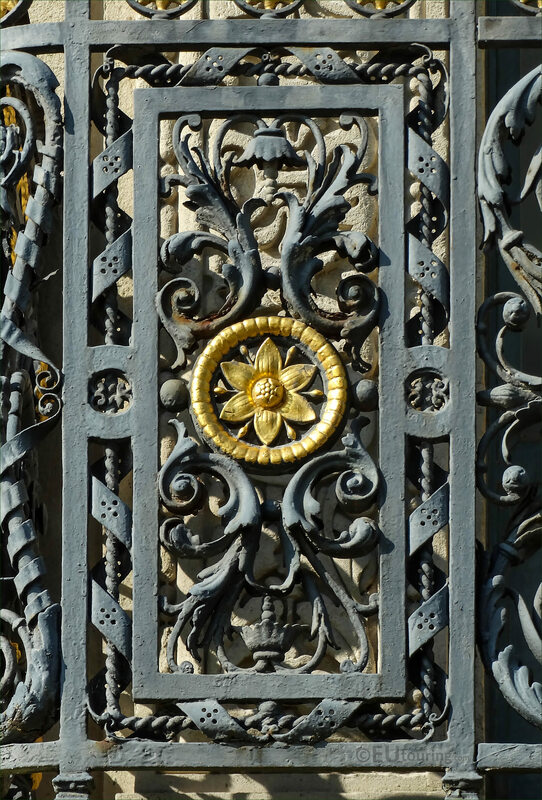 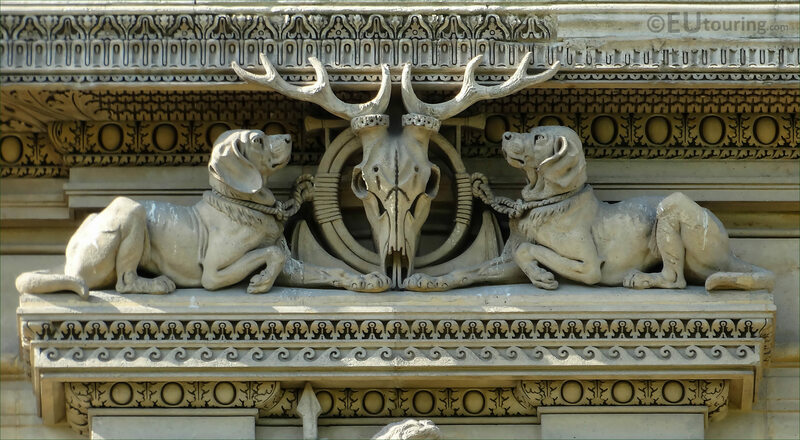 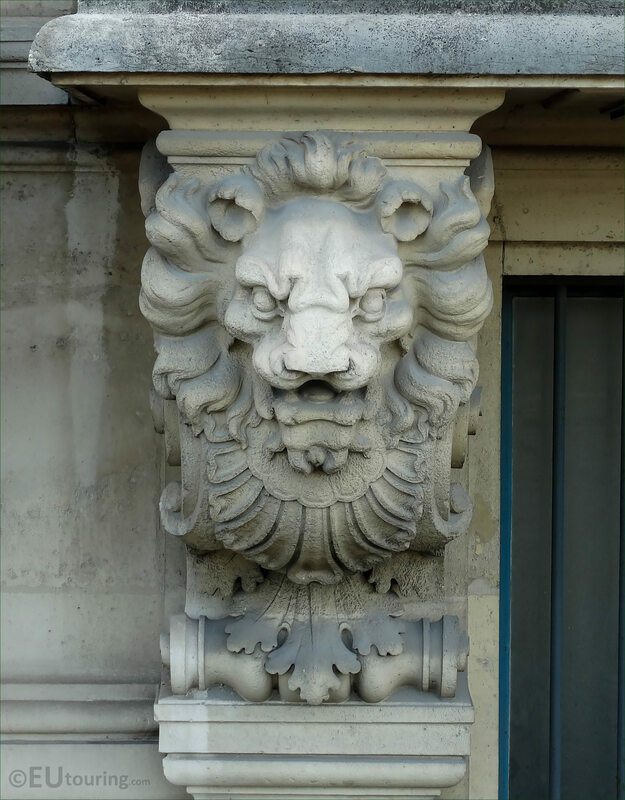 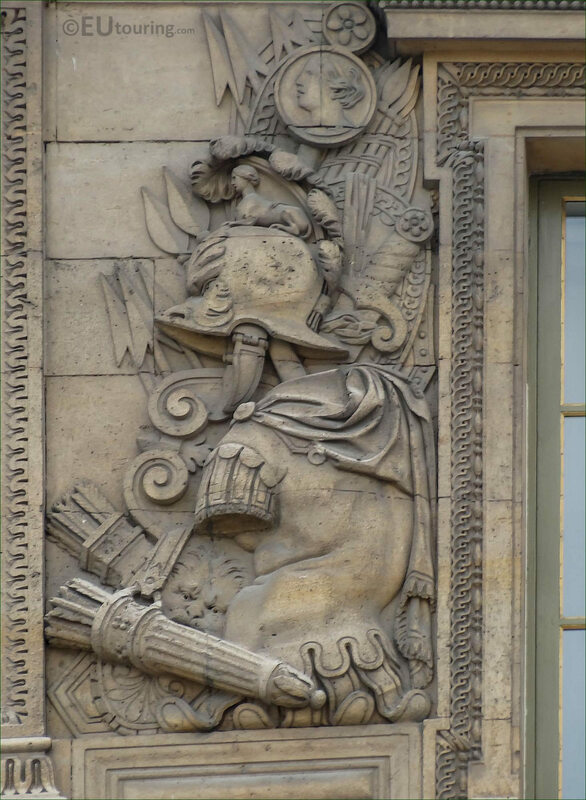 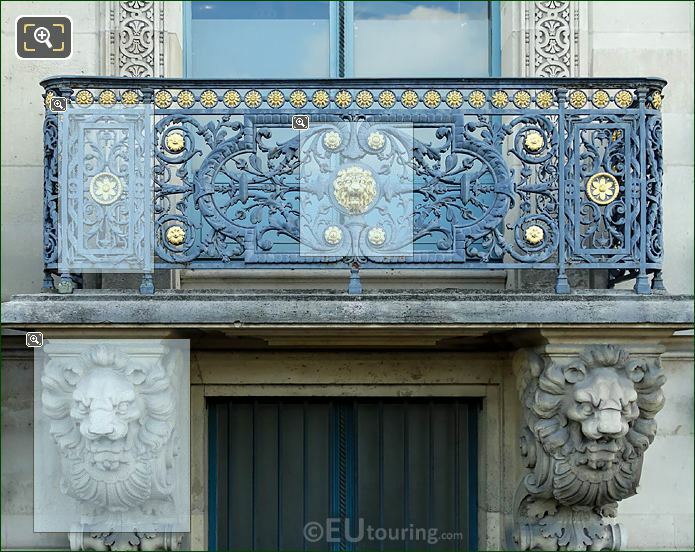 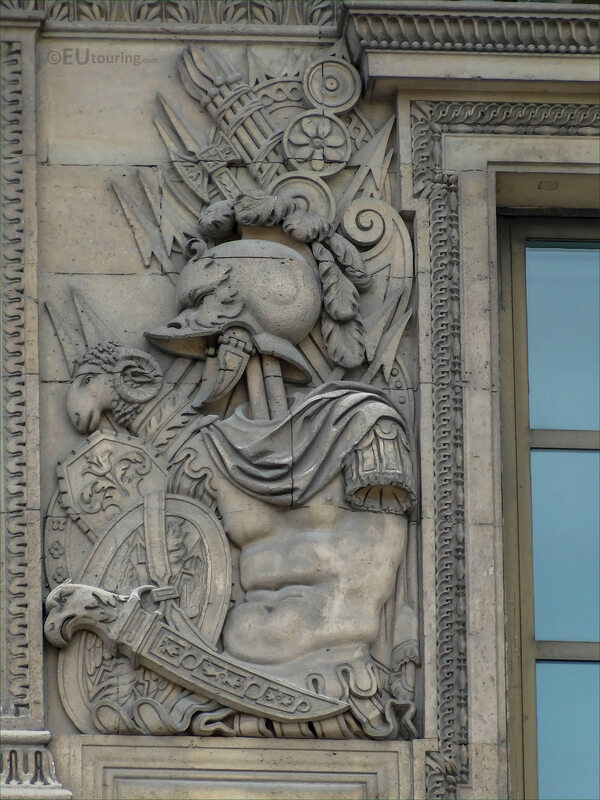 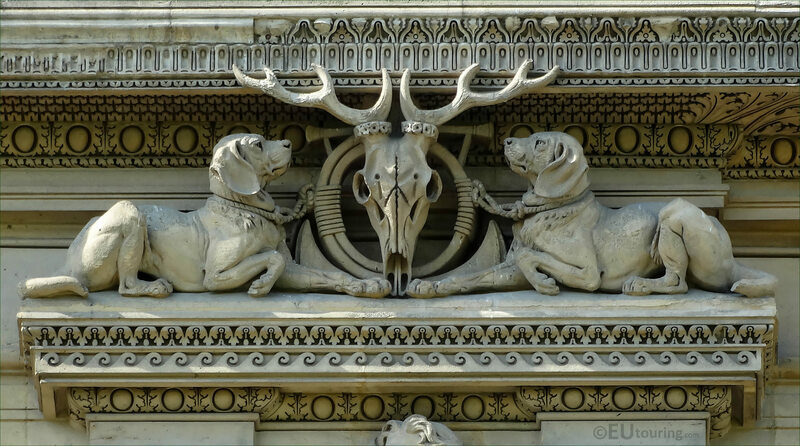 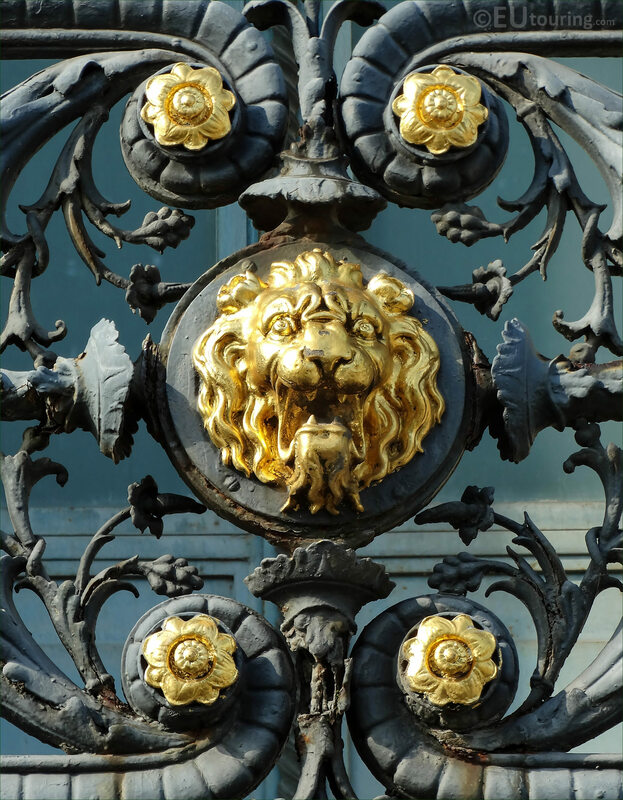 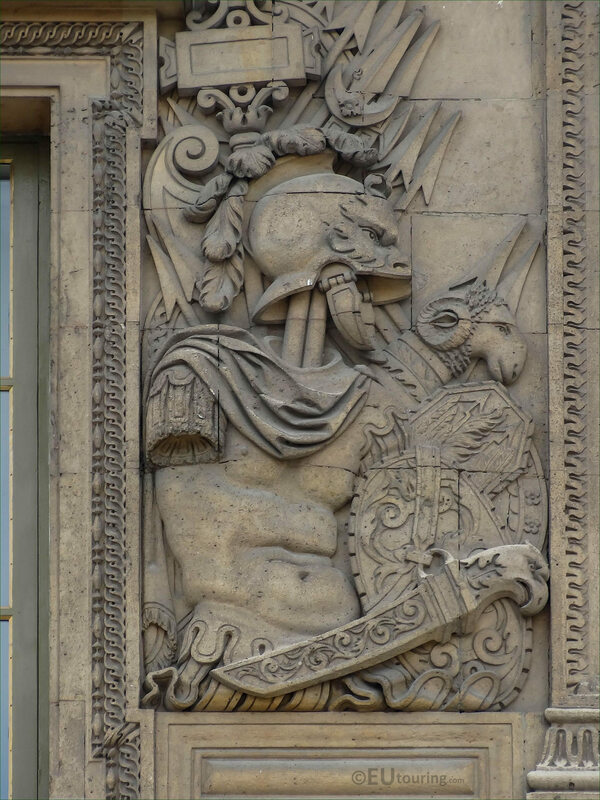 Here you can see a close up photo showing one of the ornate balconies, with its wrought iron work and gilding, which was on the Pavillon de Flore section of the Louvre Museum facing into the Cour du Carrousel, and you can also see an even closer image of the golden lions head. 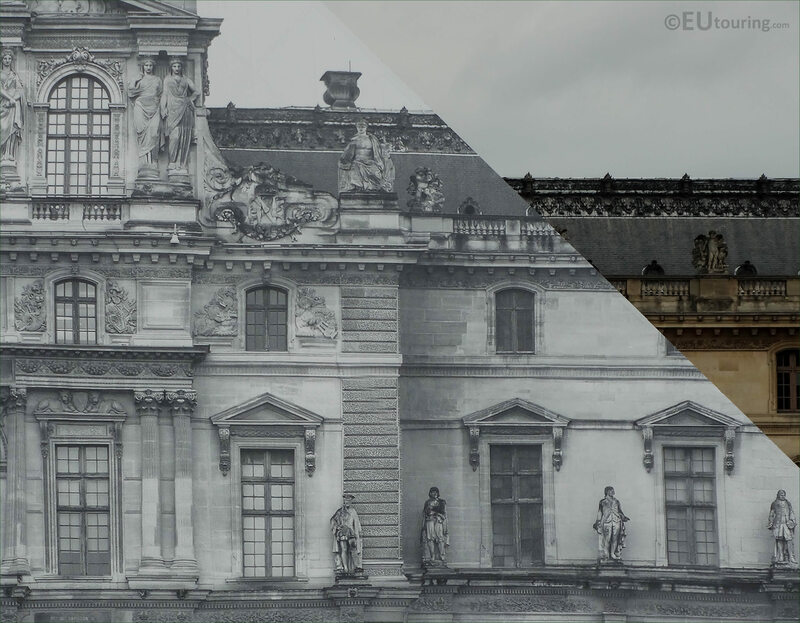 Now this is a photo we took of the Pavillon Colbert at the Musee du Louvre and on the top plinth you will see there is a statue located on either side, and these were produced by Louis Elias Robert in 1857, with the one on the left being called La Science, whereas the one on the right is called L'Industrie, plus many of the other sculptural decorations on this pavilion facade were also produced in the 1850s when The Louvre was being renovated. 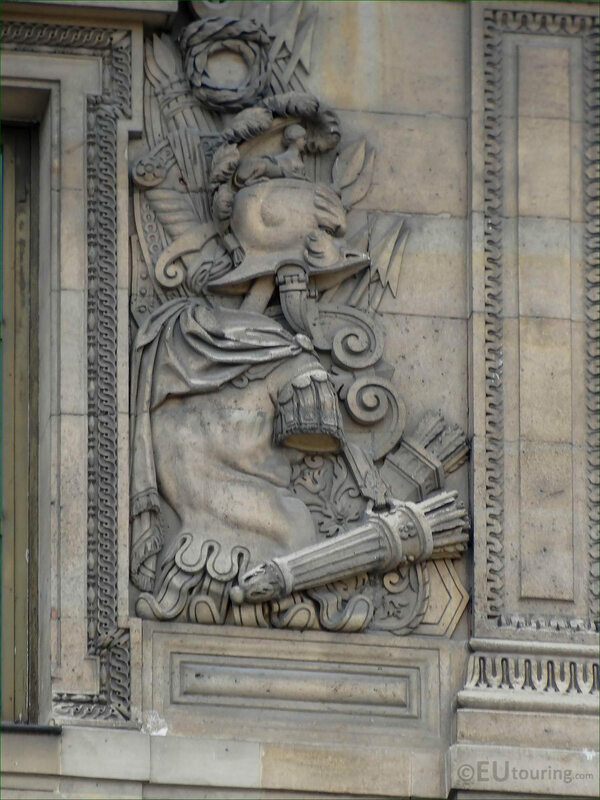 Yet as you enter the Passage du Pavillon Saint Germain l'Auxerrois on the Aile Est as you are going into the courtyard of The Louvre called the Cour Carree, you will come across a vaulted ceiling and an ornate sculpture above the door that you can see here, which is called La Piete and this was produced by the French Renaissance sculptor and architect, Jean Goujon, way back in around 1560. 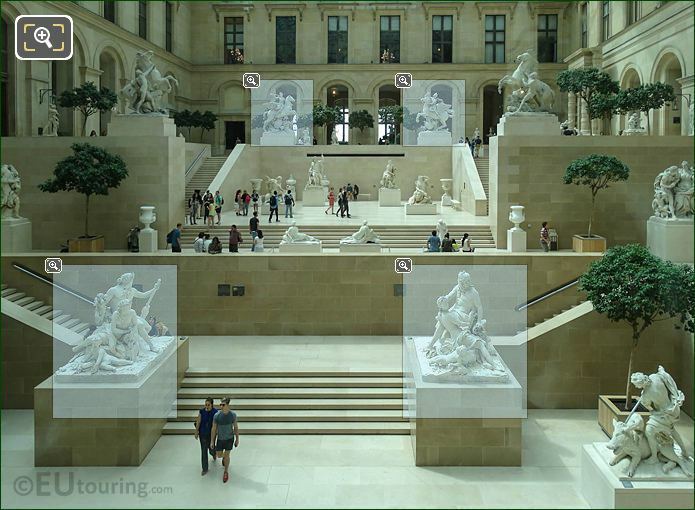 This is a photograph we took showing some of the many tourists and Parisiens enjoying themselves within the Jardin des Tuileries and relaxing on the free chairs that are set out, and you can also see a part of the Cour du Carrousel and the Pavillon Turgot wing of the Musee du Louvre, which is located on the side by the Rue de Rivoli in the 1st Arrondissement of Paris. 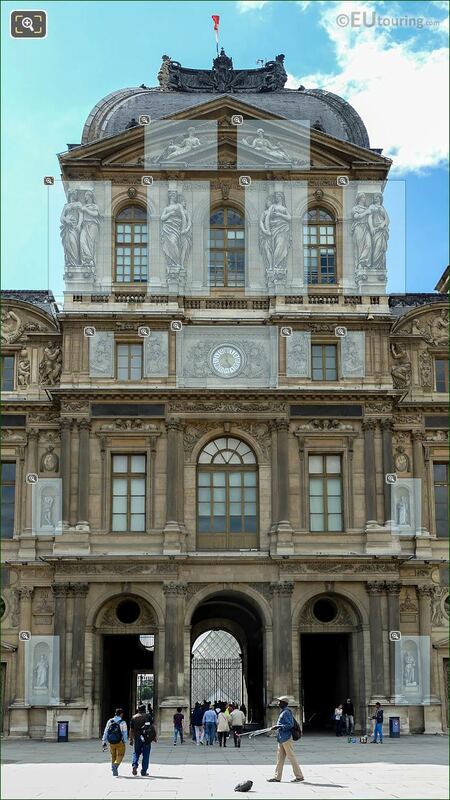 Here you can see a photo of The Louvre Museum which we took to show the I M Pei pyramid that has caused a lot of controversy, yet is now the main entrance and has proved to be a phenomenal success, but you can also see one of the water features in this image that was taken from the central courtyard facing towards Pavillon Richelieu. 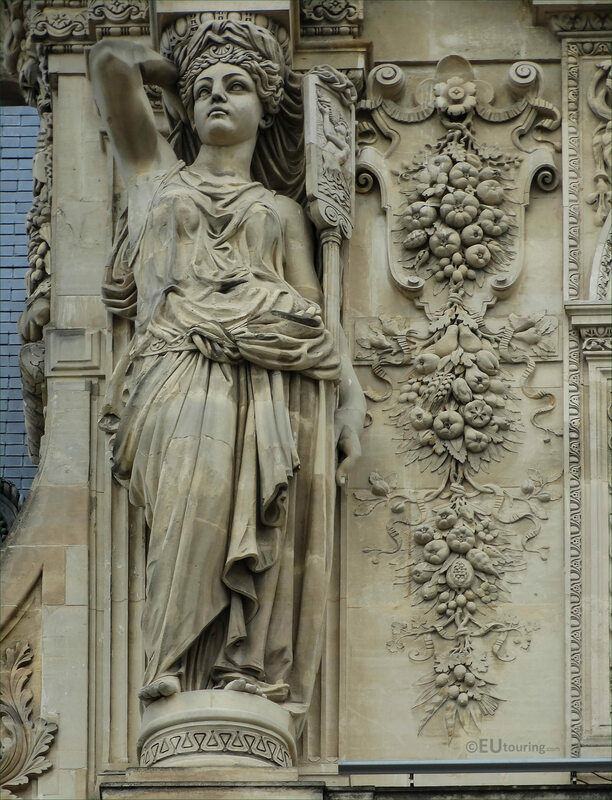 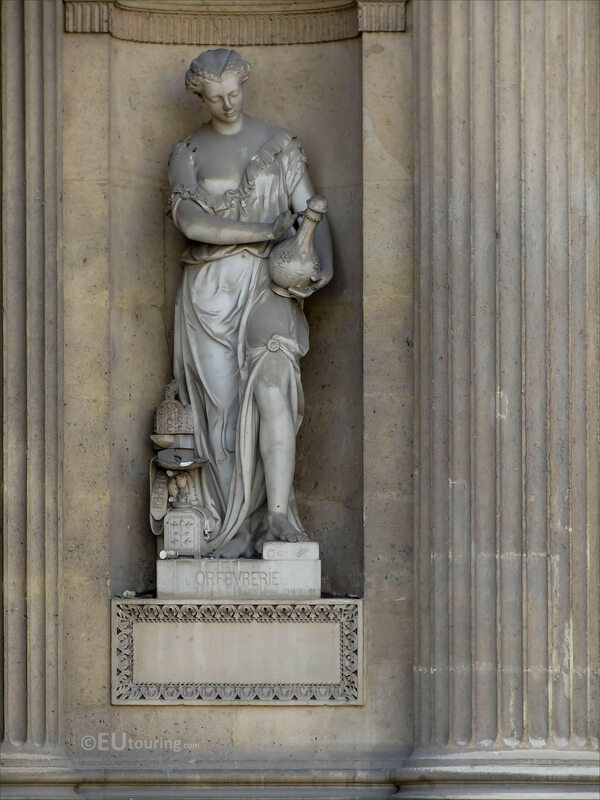 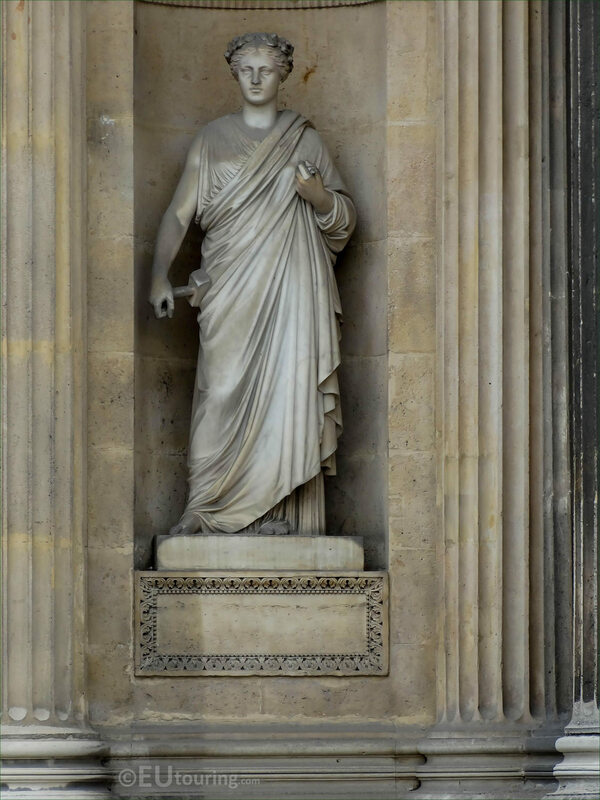 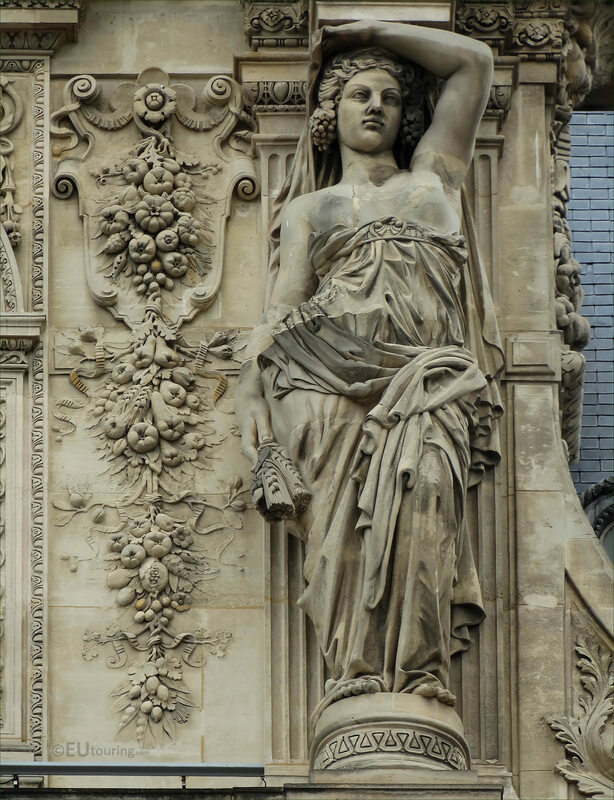 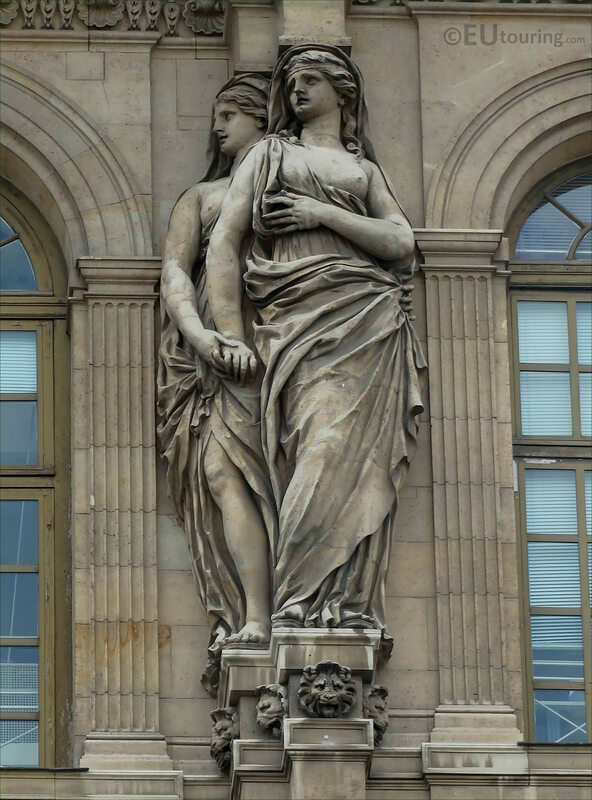 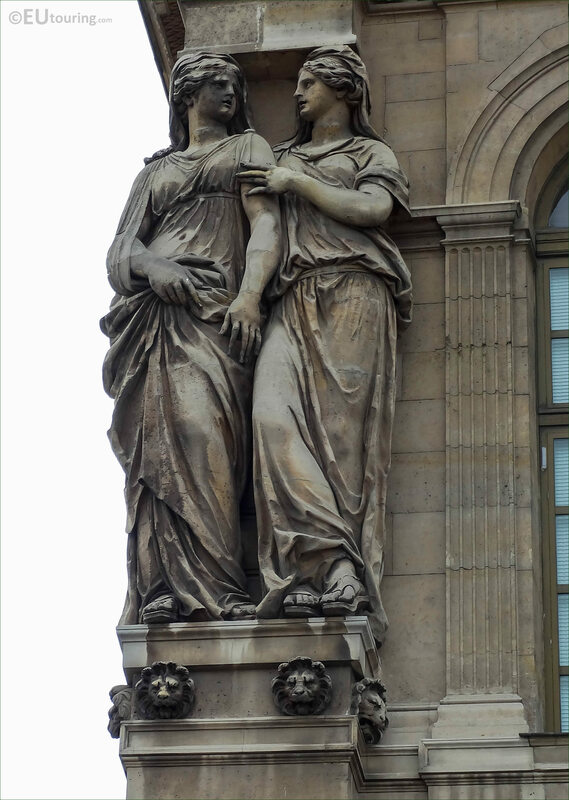 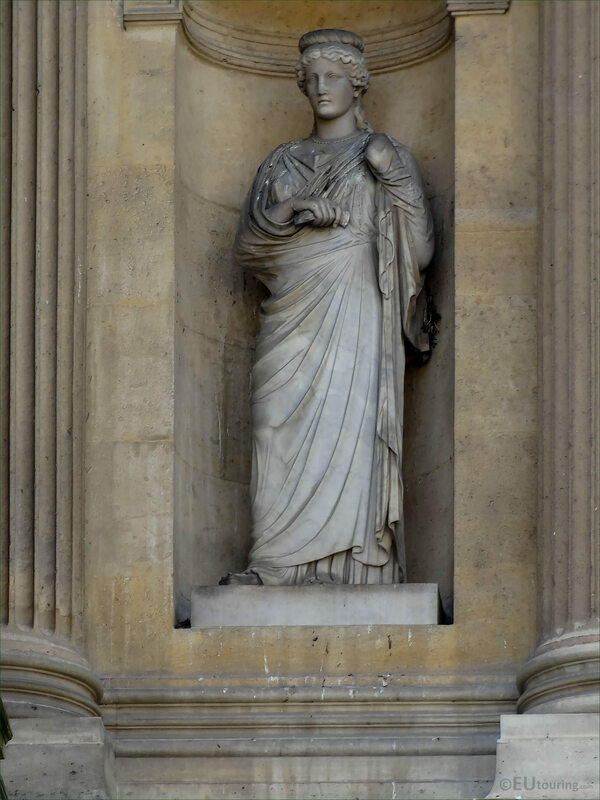 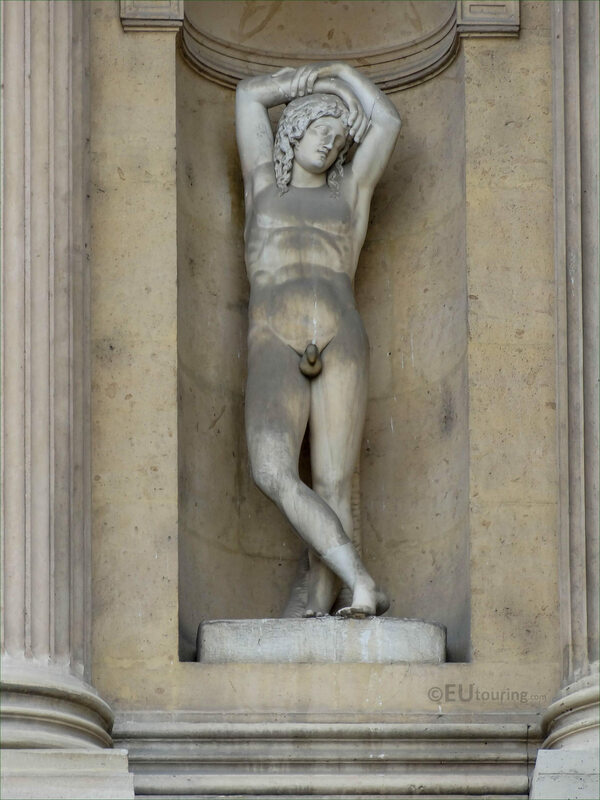 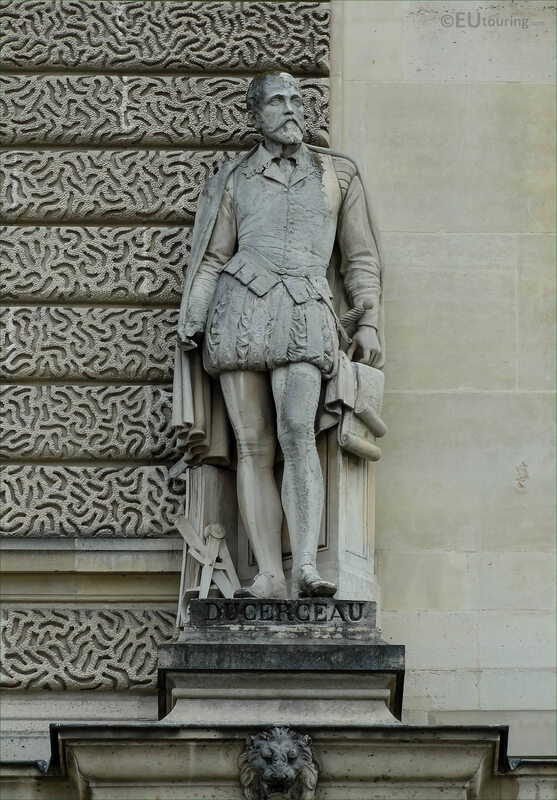 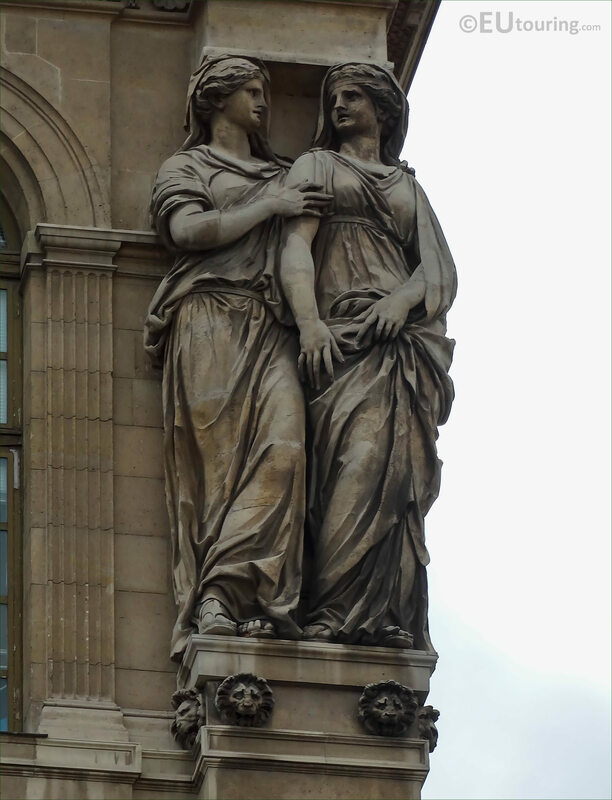 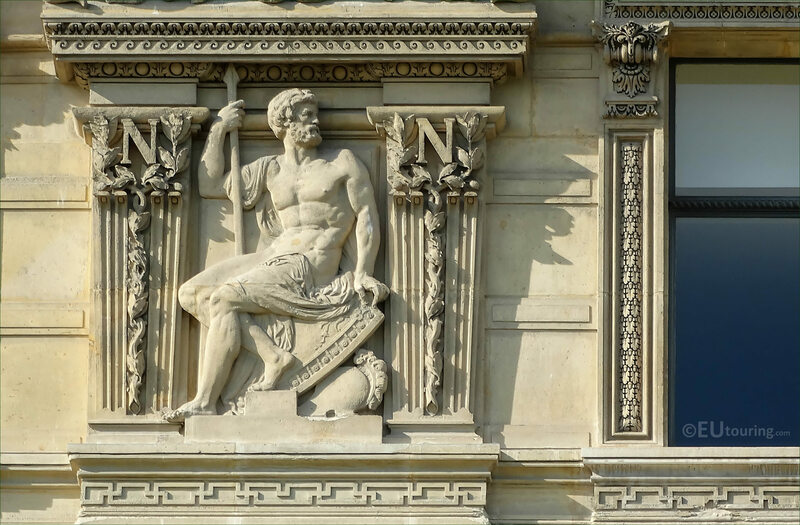 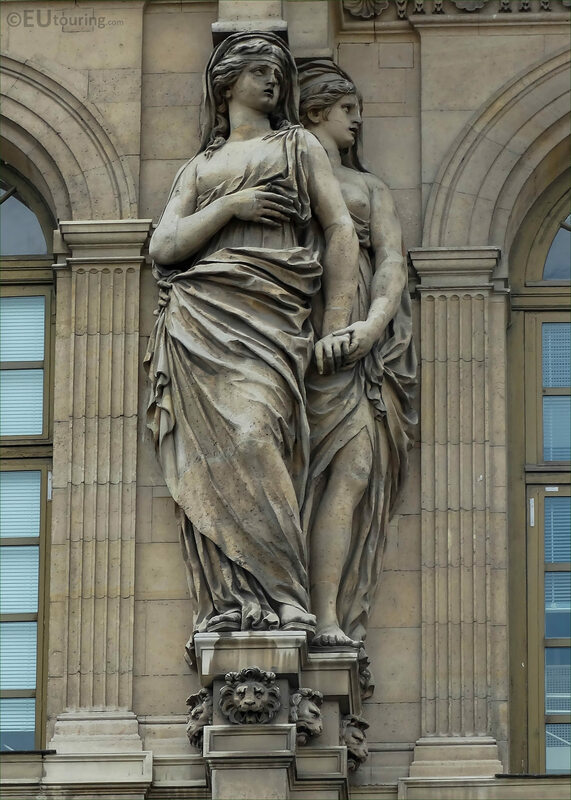 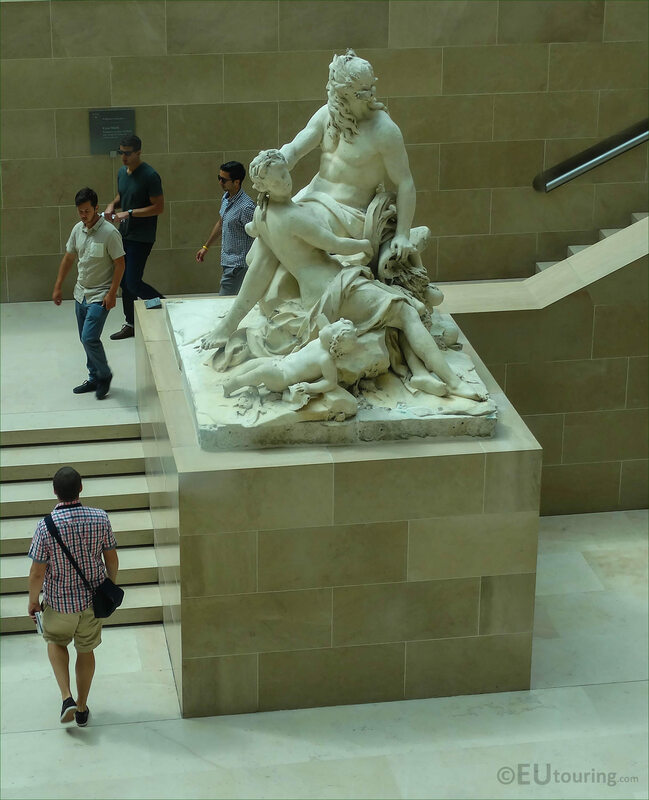 This close up photo shows just one of the many different statues that can be found at the Louvre Museum, but this particular statue group, sometimes known as an allegory, was sculpted by the artist Antoine Augustin Preault who designed this sculpture to represent Peace, and this can be found in the corner on top of the Aile Henri IV wing, which was sculpted during the 1850s. 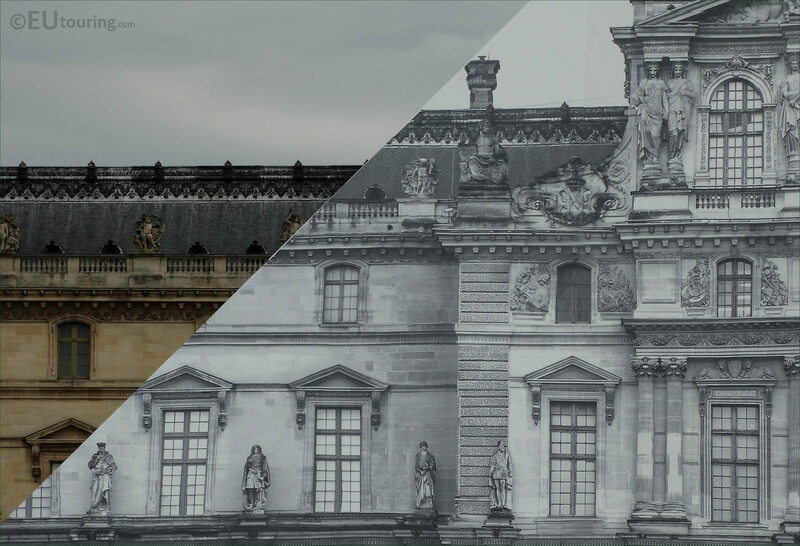 We took this high definition photo from the Cour du Carrousel standing just behind the triumphal arch called the Arc de Triomphe du Carrousel, which was commissioned by Napoleon Bonaparte I, and this image was taken looking in an easterly direction towards just a part of the most visited museum in the world. 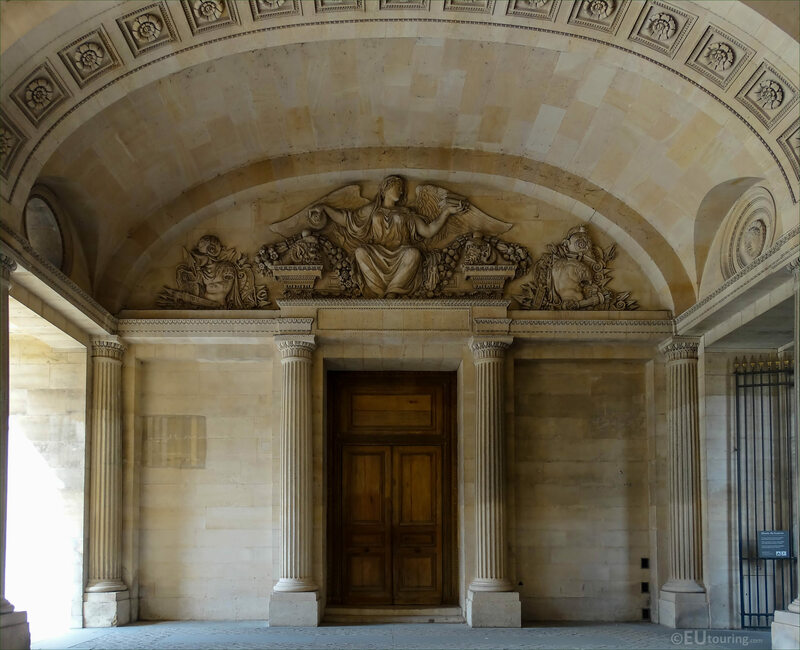 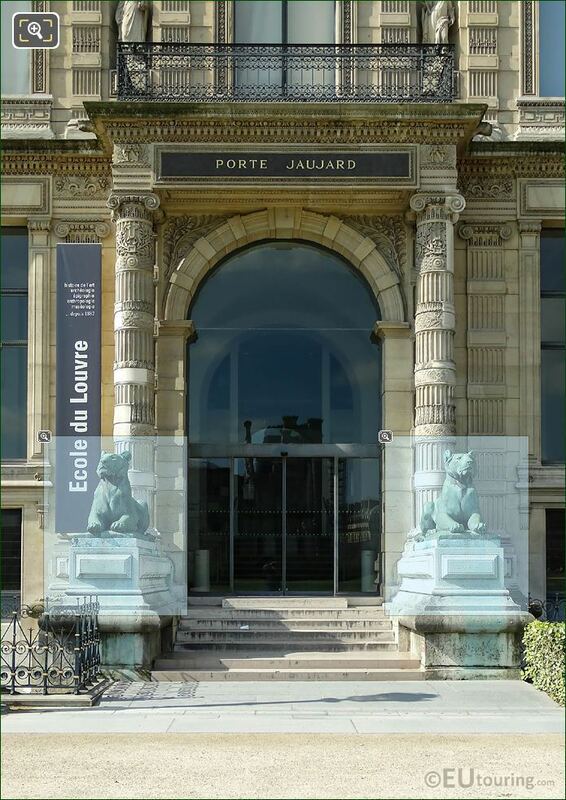 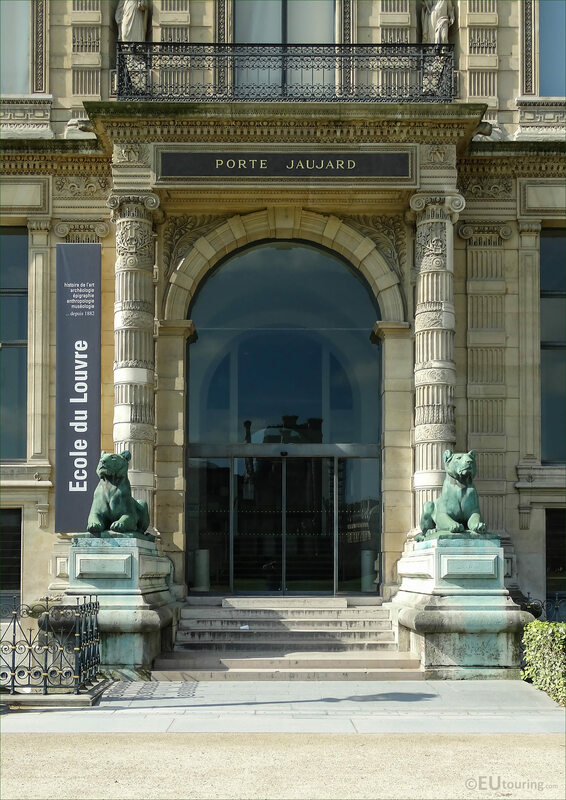 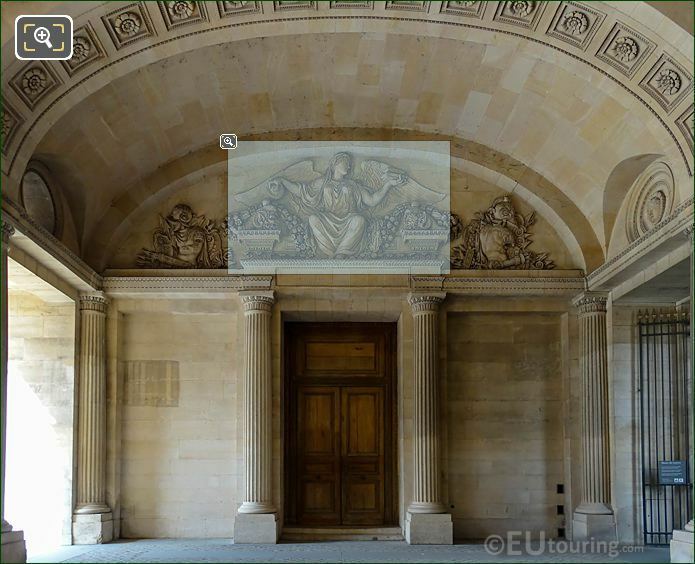 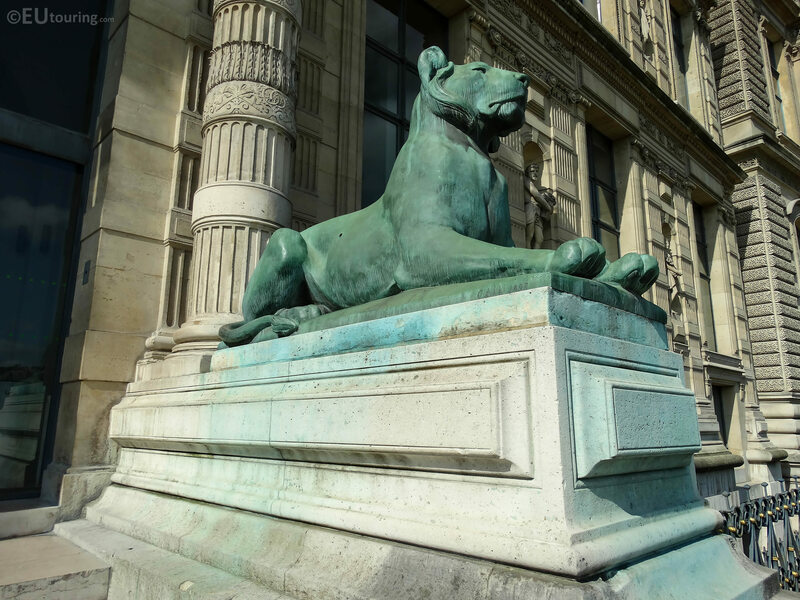 However, this next image shows an entrance at The Louvre called Porte Jaujard, which as you can tell from the sign to the left of the door, it is the entrance to the school where people can further their studies in art history, archaeology, museology, etc, and this entrance is flanked by two bronze lion statues that were sculpted by Auguste Cain. You will find that many different castles, chateaux and even mansion houses have interior courtyards, and this photograph shows the Richelieu inner courtyard at Musee du Louvre, which as you can tell, now has a glass roof to protect the exhibits and its visitors from the elements, yet still allowing natural light to shine through. 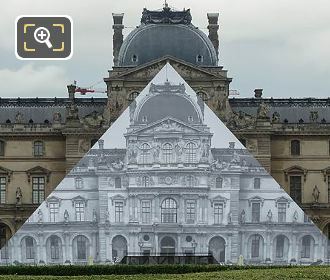 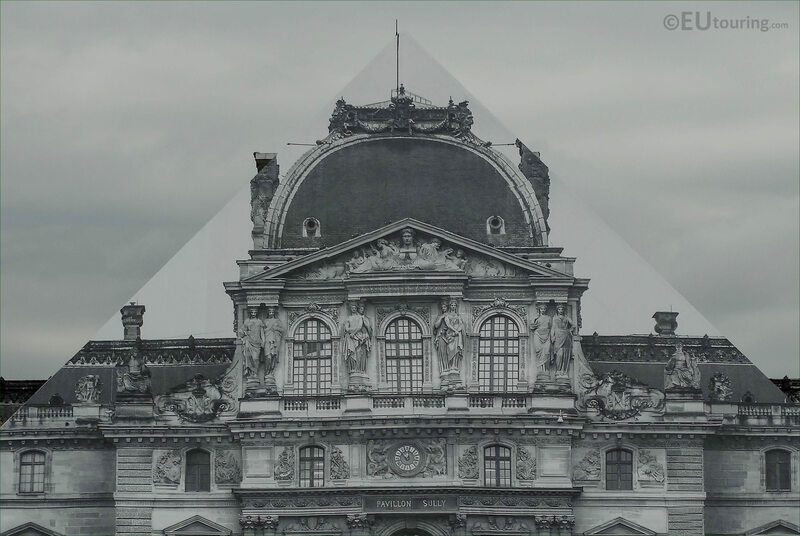 But here is another angle showing the disappearing pyramid at the Louvre Museum, which is actually a very large format anamorphic photograph of the western facade of Pavillon Sully, that was then printed and applied onto the glass surface of the pyramid, so when standing in a certain position the pyramid would seem to disappear. 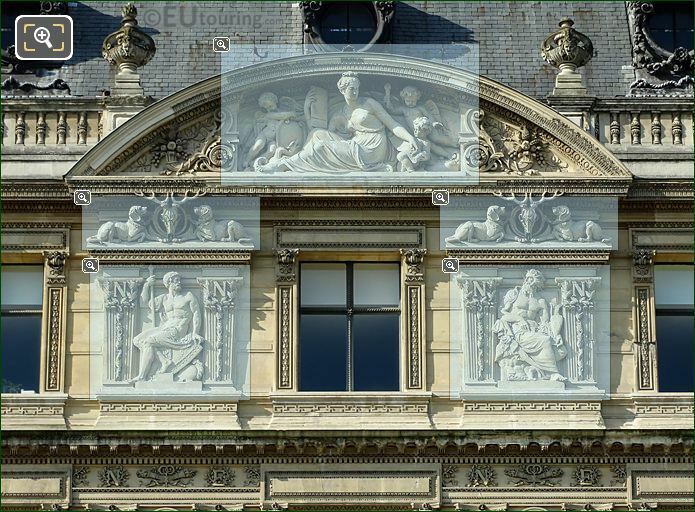 From the statues through to stone carved sculptures in between the windows called caryatids along with ornate pediments and many other architectural details, you can no doubt understand why the Musee du Louvre is classed as an historical monument in Paris, and even the outside is a fascinating building to discover, as you can see from this high definition photo of Pavillon Richelieu, yet alone the phenomenal displays inside. 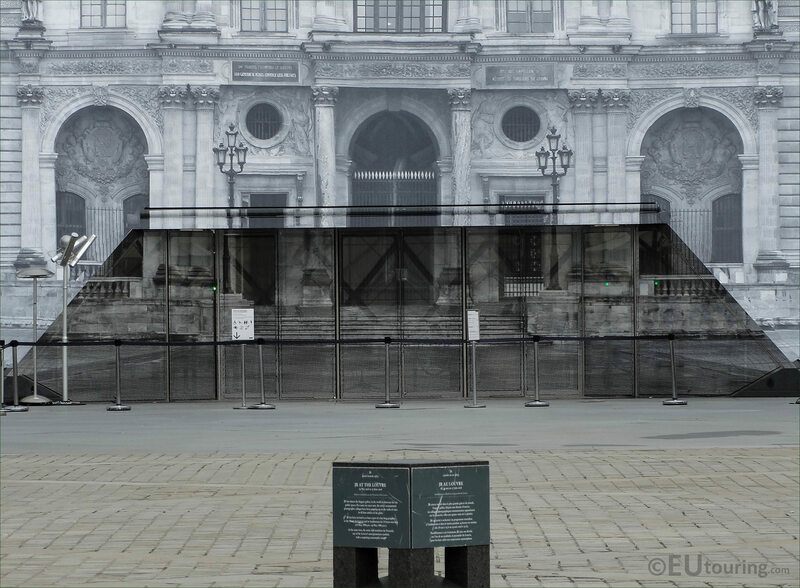 Whereas this photo shows one of the walkways with its lamp posts and floor grates next to the Aile Colbert wing of The Louvre museum, and we feel that it provides a good perspective of how large the former palace really is, considering that going way past the pyramid is another section of this museum to the left of the image going right up to the Arc de Triomphe du Carrousel that you can just see in the distance, before you reach the Tuileries Gardens. 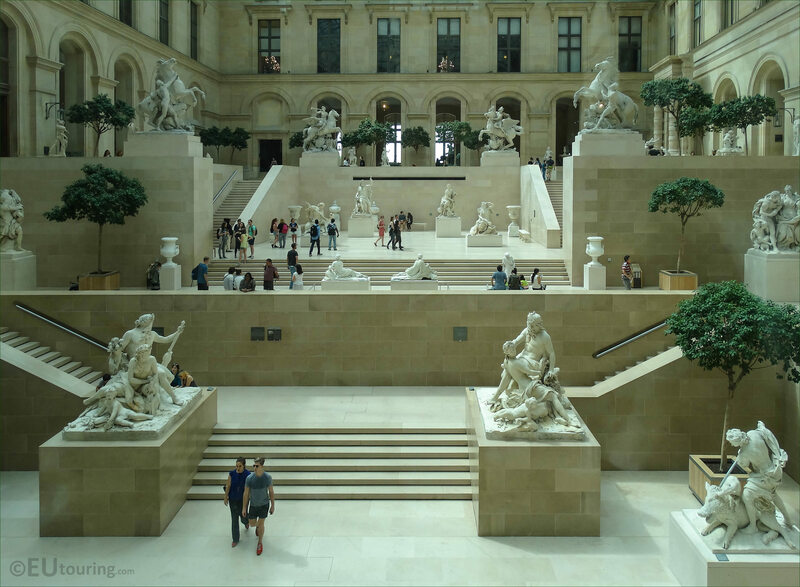 The Louvre is one of the most popular tourist attractions in Paris, as you can no doubt tell from this photo with the amount of people that were around enjoying the nice weather, not forgetting the beautiful architecture, its colonnades and stone statues adorning the former royal chateau, which has now become recognised as one of the most impressive museums in the world. 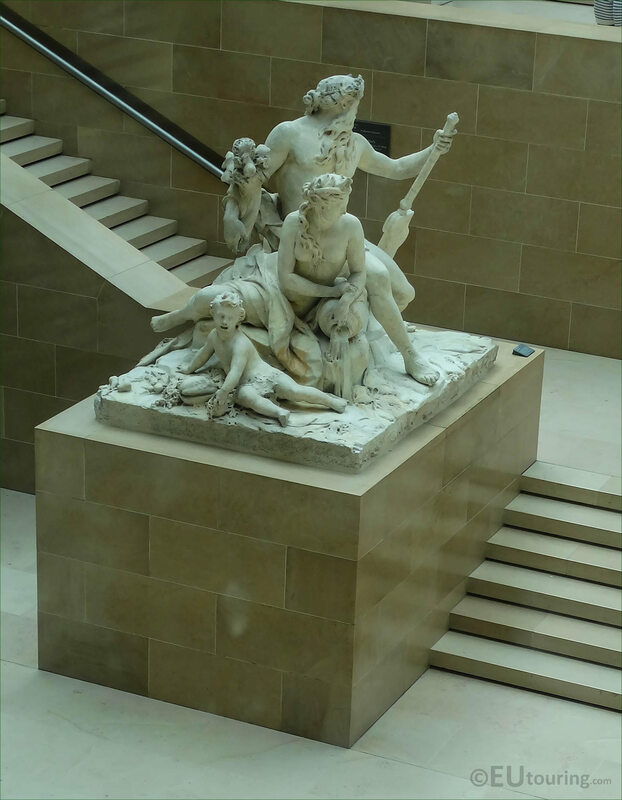 And here you can see Aile Mollien walkway at The Louvre, which are also known as colonnades or galleries, and even these just seem to go on, and on, yet have impressive architectural features and carvings, that make even the outside of the museum a fascinating place to spend some time while you are on holiday in Paris. 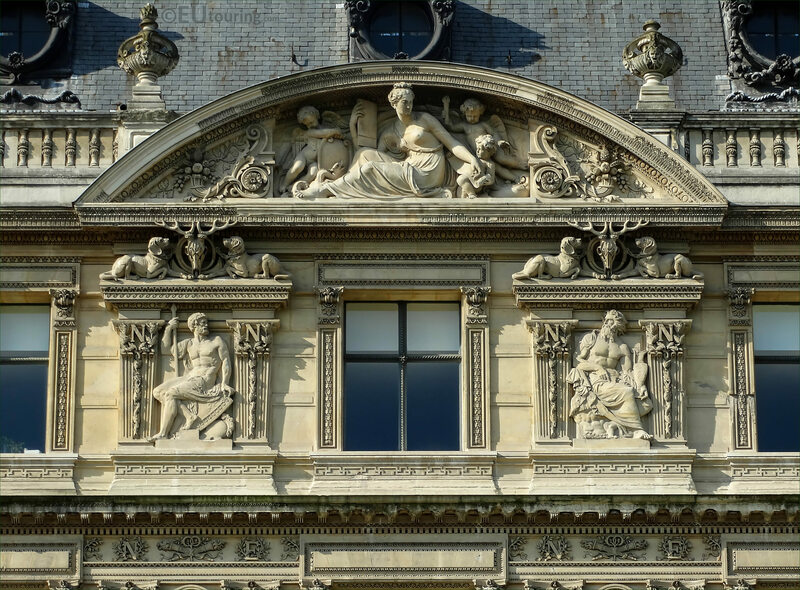 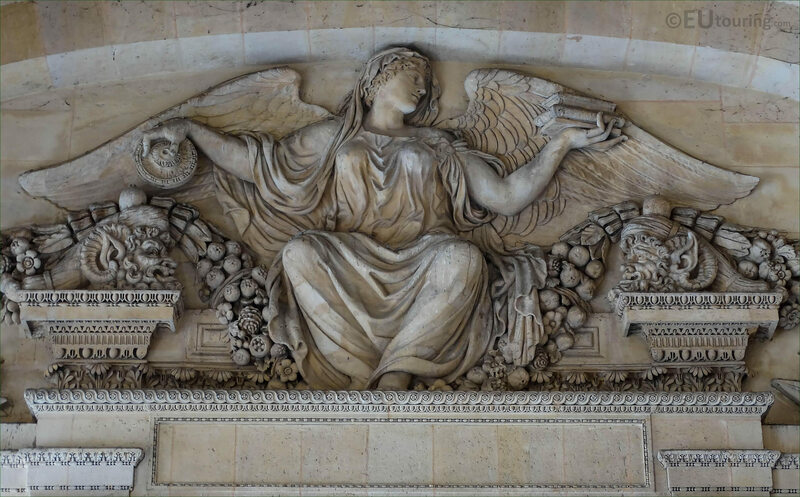 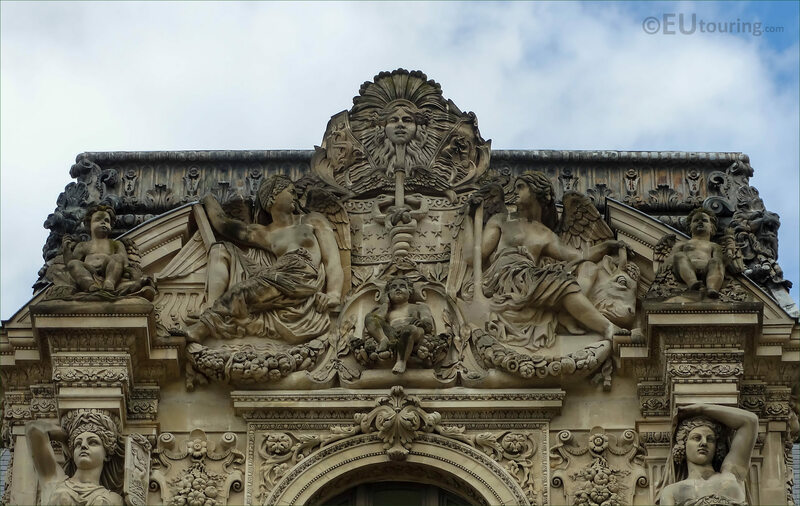 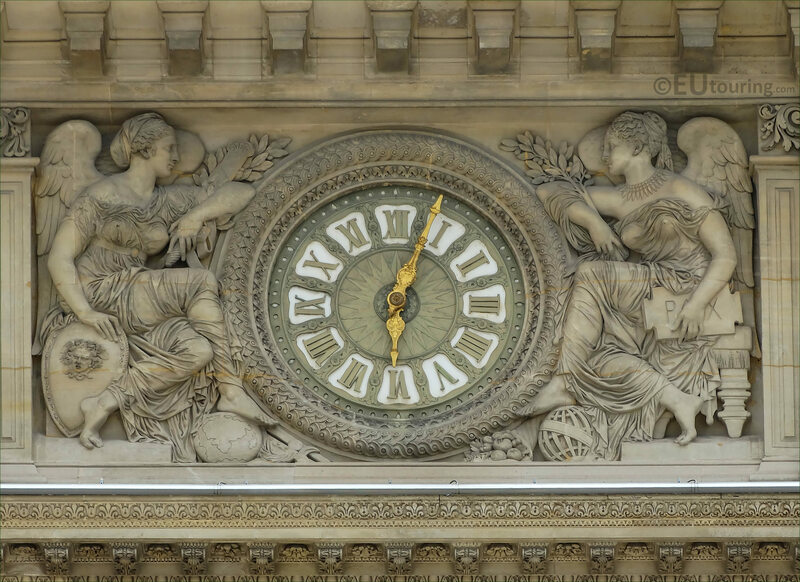 The grandeur of this former palace is not just impressive but wherever you look, there are different ornamental sculptures and architectural details that makes even the facades of The Louvre Museum so awe inspiring, just like some of them you can see in this image on the Sully wing, and if you look closely underneath the clock with the sculptures surrounding it, which are called La Paix et la Guerre that were produced in 1857, there is a plaque that reads Pavillon Sully. 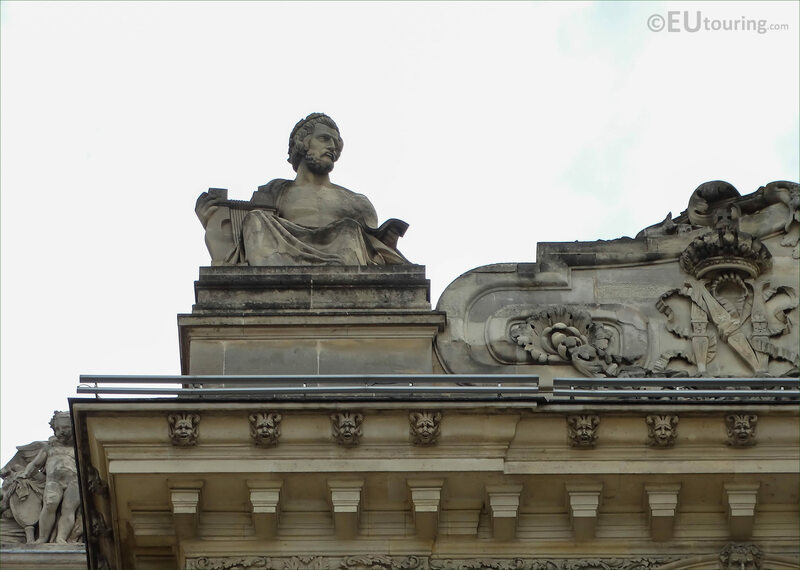 Looking from front to back, this photo shows the Pavillon de Flore, Aile de Flore, then the Pavillon des Etats that is to the left of the picture, which is one part of the south side of the Louvre museum closest to the River Seine, so it is no wonder that people say you need at least a day or more to discover this former palace turned museum, as this image does not even show you the very end of the wing on this impressive chateau within the heart of Paris. 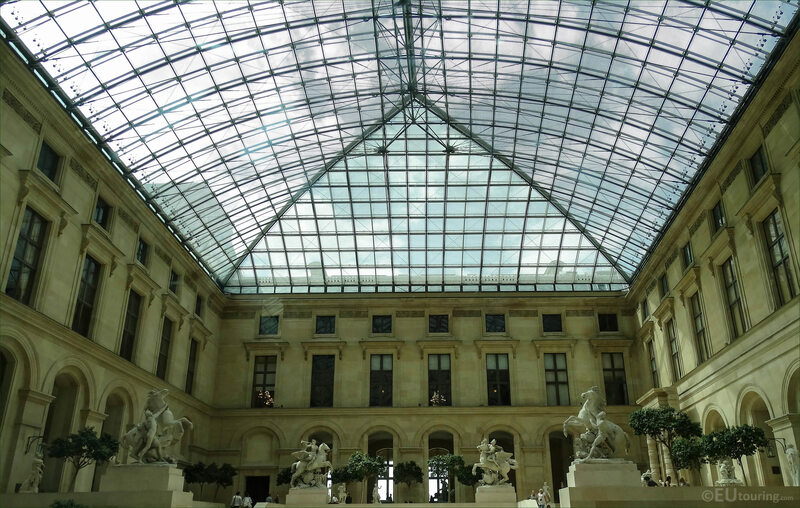 So again, as we were standing in the main courtyard of the Musee du Louvre called the Cour Napoleon, when we took this photo that shows a part of a small pyramid, which acts as a skylight, along with the large pyramid that was designed by I M Pei back in the late 1980s, providing the complete contrasts of old and new, yet it is a lovely place to sit and relax by the water feature on a hot summers day.